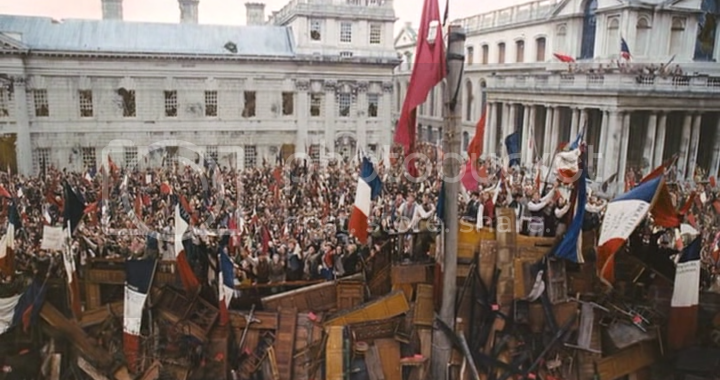 I had been fairly unfamiliar with Les Mis before Tom Hooper’s adaptation. I knew the basic story, some character names and the more famous songs (‘I Dreamed A Dream’ and ‘On My Own’), but I didn’t really know the play. So, going into this with fresh eyes, I had absolutely no expectations or basis for comparison. Whether that was a factor in me adoring the film or not I don’t know, and frankly, I don’t care. It’s easy to see Hooper is enjoying himself here. As the film bursts into life with a huge, sweeping opening shot over a grounded ship as it’s dragged into dock by hundreds of prisoners, accompanied by an epic opening number (“Look Down!”), the tone is instantly set and the grandeur of which Hooper is trying to achieve shown off. With The King’s Speech he had to be a little quiet behind camera; here he’s shouting his lungs out. The cast would struggle to be more A-list, boasting the talents of Hugh Jackman, Russell Crowe, Anne Hathaway, Amanda Seyfried, Eddie Redmayne, Helena Bonham Carter and Sacha Baron Cohen. The question on everybody’s mind was can they all sing? A question that was quickly answered, and a fear that was quickly put to rest. The entire cast is uniformly excellent, both from the acting side of things and the singing. Even Russell Crowe, who has unfairly taken a lot of stick from critics and moviegoers alike, was really great as Javert. Perhaps he doesn’t have the best singing voice in the world, but it’s certainly not a bad one, and to be honest, it’s perfect in providing the rough, icy edge the character requires. Jackman is a solid and likable Jean Valjean, and relative newcomer Eddie Redmayne is impressive as Marius. His voice has a range that would make most jealous. Hathaway has been in the spotlight with this one, earning an Academy Award nomination for her portrayal of Fantine, and rightly so. Despite being on screen for a very small portion of the film’s running time, she really does give an astonishing performance that leaves a lasting impact. Being quite unfamiliar with the play beforehand, as has been mentioned, meant I didn’t know the majority of the music, but this has swiftly become one of my favourite musical soundtracks. From the uplift of ‘One Day More’ to the heartbreak of ‘Empty Chairs At Empty Tables’ to the sheer power of ‘Do You Hear The People Sing?’, it’s all just wonderful. The interesting thing about Hooper’s approach to this adaptation is (as I’m sure most already know) the singing was performed live on set, rather than being pre-recorded in a studio. This method has proven to be quite divisive with viewers, as some feel it enhances the performances by bringing an extra level of emotion into the mix, while others feel it detracts from the quality of the singing, and therefore the quality of the performances. I’m definitely of the opinion that it improves the performances, and in turn improves the film. I like the fact that they sometimes lose words through emotion and whisper lines through tears. To me, it gives a much more naturalistic feel to the story and it makes certain moments that much more heartbreaking. I think it also almost makes us believe that they would be singing if this were real life. Some people (generally non musical fans) feel that musicals are often too unrealistic because characters are always breaking out into song. Not that I agree with this criticism anyway, but it certainly can’t be applied here. I’m not in any way ashamed to admit I was reduced to tears more than once. The whole film is an emotional roller coaster, and the final scene in particular packs such a raw emotional punch that it’s a struggle to see anyone making it through with dry eyes. The best films are the ones that genuinely affect us in some way. Whether that’s to make us laugh, cry or scream, we want to actually feel something, and with Les Misérables, we really do. An epic, cathartic and truly powerful piece of cinema that shouldn’t be missed. Excellent review – makes me want to see it now.